As of early yesterday morning my oldest sister Tina still didn't know about my humble little blog. For some really odd reason she never got the 2 emails that I sent to her. That has never happened before! So while I was getting ready to head out the door I forwarded it to her work email. She called me immediately! No surprise there. :) Just as I expected, her first thought was that I am sick and of course she wouldn't keep that secret to herself, but then she reread the email and realized that she was way, WAY off base. It did say "it is fun" after all. She made a solemn, pinkie swear promise not to tell any of the rest of the family so I sent her the link, first to the initial post about this little ongoing saga, then the follow up one and then she took a bit more look around. She even commented! No she isn't mad at me and I can't help but chuckle at the fact that I was trying to share this place with her and she wasn't getting my emails that were meant to clue her in. At least she knows now and she is here. In fact she became follower number 300! 5-10-15+ Fat Quarters from House of White Birch. It is chock full of great quilt patterns and ideas to make your projects using precuts shine. How about a pretty keeper for your glasses? I hope I don't need one of these some day. This table runner would look great in any combo of fabrics. Need a nice tote bag? This book gives you all the instructions to make one of your own. I could see this in done different color ways. And you had to know that this Chinese Lantern one would catch my eye. Do you like or not like Peeps and if you do, do you prefer them fresh or dried out and hard as a rock? It is Easter season after all and what better question to ask than something appropriate for the time of the year. 2) Since this is to celebrate my 300 followers milestone, you must be a follower to be entered into the drawing. Entries will remain open until Noon EST on Friday March 15th and I'll annouce the winner that afternoon or on Saturday. Please remember to leave your email address if you are a No Reply Blogger so that I can contact you. Better yet, fix that nasty problem once and for all and help all of us who want to help you win. Info on how to do that can be found in this post. Good luck to one and all! I've gotta run for now. This morning I'm going in to work with 21 preschoolers on our secret school silent auction fundraiser quilt (a secret to the school families but won't be a secret here) and then I have to work on getting more things ready for the big upcoming kids consignment sale. Have a great day where ever you are! Update: Hmmmm! I was at 300 followers yesterday but am now back down to 299. I wonder who left and why. Oh well, I guess I can't please everyone all the time. No sweat. I'm still continuing the giveaway, don't worry, but hopefully I'll gain some new readers and the number won't dip again. Great book! Thanks for the chance to win it!! I follow you and I like peeps. Slightly stale is my fave. Finally...I'm glad your sister can now see what we see. I'm not a peep lover, but my husband is and he likes them fresh. Yep, I follow you and love it. Congrats on 300! I do not like Peeps - not even a nibbles worth but I adore Gold Brick eggs! I don't mind peeps but they must be fresh. Not my favorite Easter candy though. Glad your sister is on board! I am not a Peeps person :P Thanks for the chance to win this wonderful book! Yay! Congrats on reaching 300!! The book looks awesome and I'd love to win it!! I don't think I've ever had a peep... they are all over the internet but not in my grocery store!! I think peeps are one of the nastiest creations second only to fruit cakes. ICK! But obviously they have minions because they come in almost every holiday season and color of the rainbow nowadays. Pretty on the store shelf but still...ICK. Glad she finally found her way to your blog:) what a funny story to follow though. Soooo weird. Been following for some time. Congrats on 300...I just passed 250 so I know this is exciting for you. The book is a great prize! Glad you sister in now following! I don't like peeps but I sometimes buy them for my husband and son who like them. My SIL is CRAZY about them and used to buy them and freeze them so she could have fresh ones all year long. Of course, now they sell them for every holiday and non-holiday so I guess she just buys fresh ones. 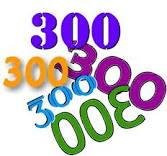 Congrats on 300 followers; I'm one of them! How lovely and special too! I don't like any gooey type candy/treats at all, so peeps are not on my candy list. Congrats on the 300 and thank you for hosting such a lovely giveaway. What a wonderful give-away! And I am really glad your sister finally knows that you have a blog! I have been a follower for a long time already! I have no idea what peeps are, but I can tell you that with Easter coming swiftly, I love chocolate eggs! I like an occasional Peep, but only at Easter. Christmas peeps are just WRONG! I prefer them when they're a few days old, not too soft, and not too hard. Congrats on 300, and thanks for the chance to win a great prize. That is so funny...and she ends up being your blogging milestone!!! I love peeps. I have a box of purple bunnies I am working on right now. I've already gone through the pink and yellow chicks! Love them SUPER fresh which is why I eat them before Easter. it's amazing these little guys are ALWAYS born quintuplets, so here they try to surgically separate them!! Please tell me what a 'peep' is?? I guess it's something to eat but I've never heard of them before!! I am a follower. I do not like peeps, though if I were to eat one it would have to be rock hard. The saga with your sister has been amusing to follow =) I don't like peeps, much too sweet. My husband on the other hand loves them nice & crunchy, after the box has been open for a few days. I am happy you told your sister. What a coincidence that she is follower 300! I am in there somewhere, too. I like peeps fresh! I can't imagine eating them rock hard. HI! SUCH A NEAT GIVEAWAY! I am a follower. My whole family know about my blog but they don't read it. Well my sister in Australia reads it occasionally and my daughter in Newfoundland reads it sometimes. My daughter's fiance is the most consistent reader and he even leaves comments sometimes. I have never had peeps. I think they must be a sort of marshmallowy candy though. I am sure I would love them as I love most candy that is soft, chewy and not sour. Janet -- peeps are great it's a marshmallow (super sweet) rolled in candy sugar and they can be different flavors. Yellow is my favorite because it does not have the after taste that some of the other colored dies have (you know like icing does). Somebody needs to send you some peeps -- stat. Michelle -- how special that your sister is number 300. I do love peeps fresh but only the yellow ones. now that they are coming out for other holidays I feel that this is helping them expand to other flavors but it is making the Easter peeps not so special. Lyndt did the same thing to me a few years ago when my favorite Christmas candy started showing up on other holidays -- now the centers taste different and I have to find another favorite holiday candy. Stay true Cadburry eggs -- your all I have left. I admit, I can't abide peeps. I'm also the lunatic who scrapes most icing off cakes. That sugary sweetness is too much for me. But, well, I'm glad for people that do like them I guess! Also, congrats on 300 followers!!! I like peeps just a bit. Maybe one or two and I'm good. I like them slightly stale but not rock hard. I also like to melt them in the microwave. Yay for you and your sis Michele! As for the Peeps - meh, I could do without them. But, if I am going to have them, I prefer them in baked brownie smores like these: http://busy-mommy.com/2012/02/peep-brownie-smores.html Congrats on 300 Michle! Congratulations! I don't like Peeps, but my husband does. How Neat Your Sister Was ,300Th Follower. I Actually Set Up My Blog For My Family To follow My quiltinG. I Love Peeps At Leasy A Week Dryed Preferably Longer, But I Usually Can't Wait That long. I am glad your sister finally knows and wasn't mad at you. I am sure you will end up with over 300 followers since only one dropped out. I wouldn't take it personally it might be more a time thing if someone is following a lot of blogs already. I am not a big fan of peeps although I can eat them. Chocolate is my thing. Congrats on the milestone and the cat being out of the bag! Not a peep fan unless your talking friends...then I love my peeps! Congratulations! I do love Peeps especially when they are fresh--soft,gooey and sticky.What's not to like? When I was a kid I loved stale Peeps. I don't eat them anymore ... way too sweet. 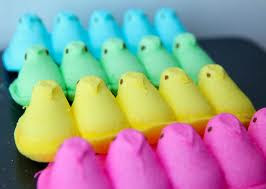 I like Peeps..in every color..YUM! I'm still a follower! I didn't leave! I don't like peeps. My guilty pleasure this time of year are Cadbury eggs. Good thing they're not available all year. I'm glad your sister is now clued in! I don't like peeps. But I buy them for my auntie on every holiday. And the first thing she does is poke a hole in the package to let them get a little stale :) I'm a jelly bean girl myself. I really don't care for peeps. I guess I had too many in my youth. Thanks for the chance to win this book that is filled with so many possibilities! Also so glad your sister found your blog. I prefer my peeps soft...I just became a follower (I read you in Google reader) and it said I was follower 300....am I your long lost sister, lol? Thanks for the chance! I am a follower who does not like the peeps. Yuck! Yes, She does know and Google is a pain! I'm a follower and I do not like peeps. How did I not know about this blog before?!? Yay! I'm glad your sister knows and is happy. I liked your post a while go about your sister's day out and the pic of you and your sisters. I don't really like Peeps. They have to be freshly opened and super-soft. But sugar-coated sugar is not my favorite. I prefer chocolate! I do not like peeps. Never even heard of them until about 2 years ago. Glad to hear that your sister now knows.